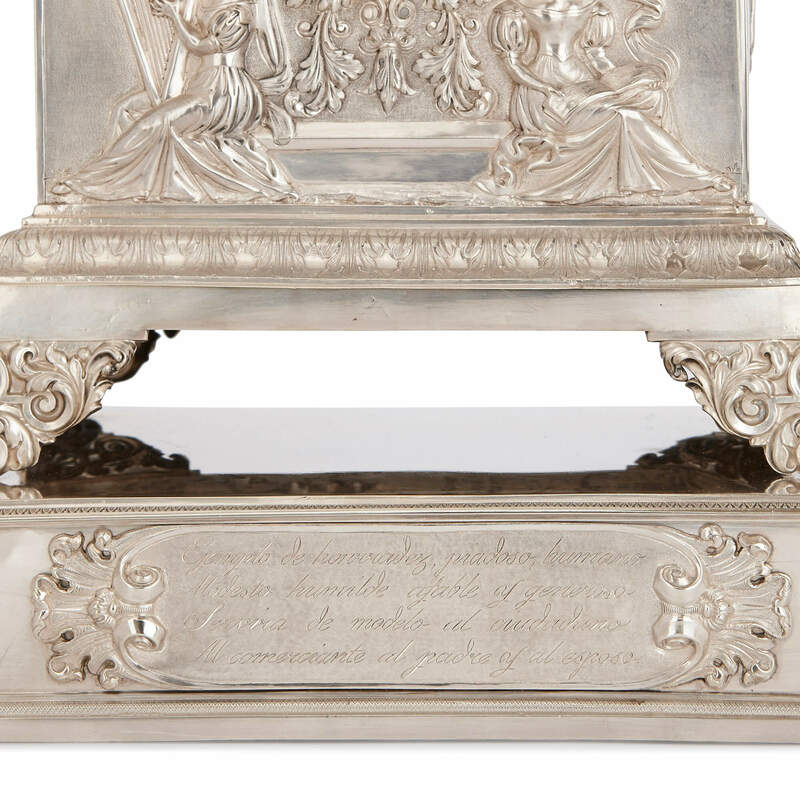 This wonderful antique Spanish silver mantel clock is a fascinating object with an intriguing inscription, originally made as a commemorative piece. This exquisite silver mantel clock was commissioned to commemorate the life of one Jaime Llavallol. 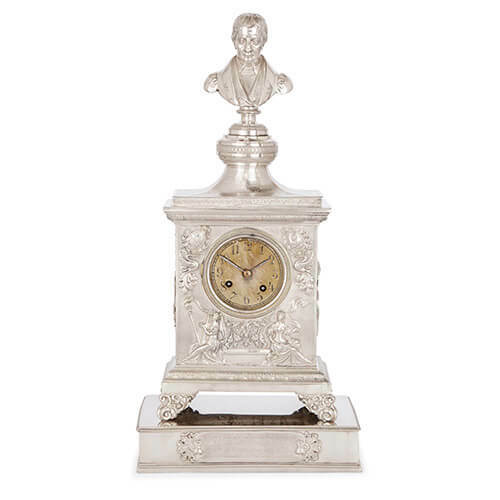 The gentleman, seen here as a cast bust surmounting the clock, is further memorialised in an inscription on the base, which reads: 'El. S. D. Jaime Llavallol / Nacio en Barcelona el 8 Set'bre de 1760 y murio en Buenos Ayres el 13 Oct'bre de 1838' and 'Ejemplo de honviadez, piadoso, humano Modesto humilde afable y generoso Servia de modelo al ciudadano Al comerciante al padre y al esposa'. This translates as, 'Mr. Jaime Llavallol was born in Barcelona on September 8th 1760 and passed on October 13th 1838, in Buenos Aires. He was an example of integrity, compassion, a humane, modest, humble, friendly and generous man. He was a model citizen, and an exemplary business-man, father and husband. 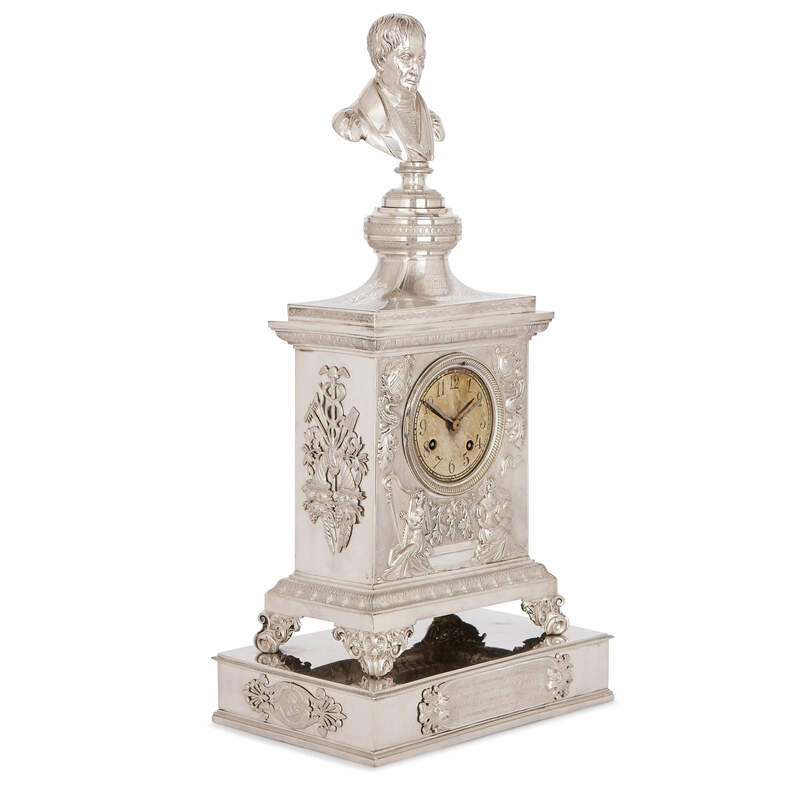 In addition to the cast bust, with its ornamental support, the silver mantel clock features a decorative frieze with egg-and-dart detailing, and the base of the main clock case is incised with acanthus leaves, all of which is supported on leafy scrolls. 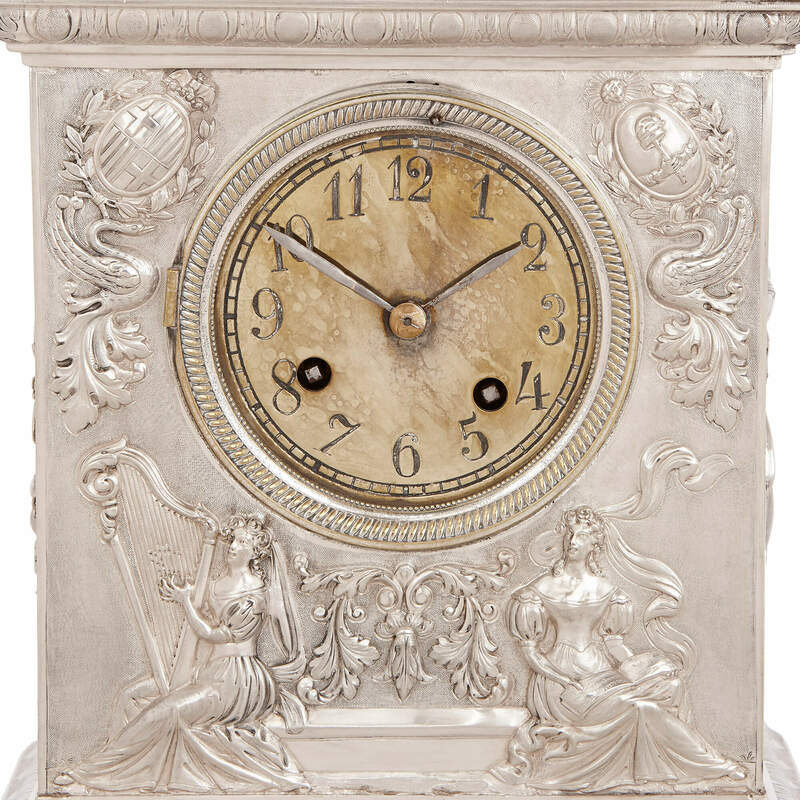 The clock face features a beautifully-worked central gilt dial, placed within a silver case that is ornamented with the classical figures of two women. The women are seated side by side, together embodying the arts - the woman on the left plays the harp and thus represents music, while the woman on the right is depicted reading a book, representing literature. 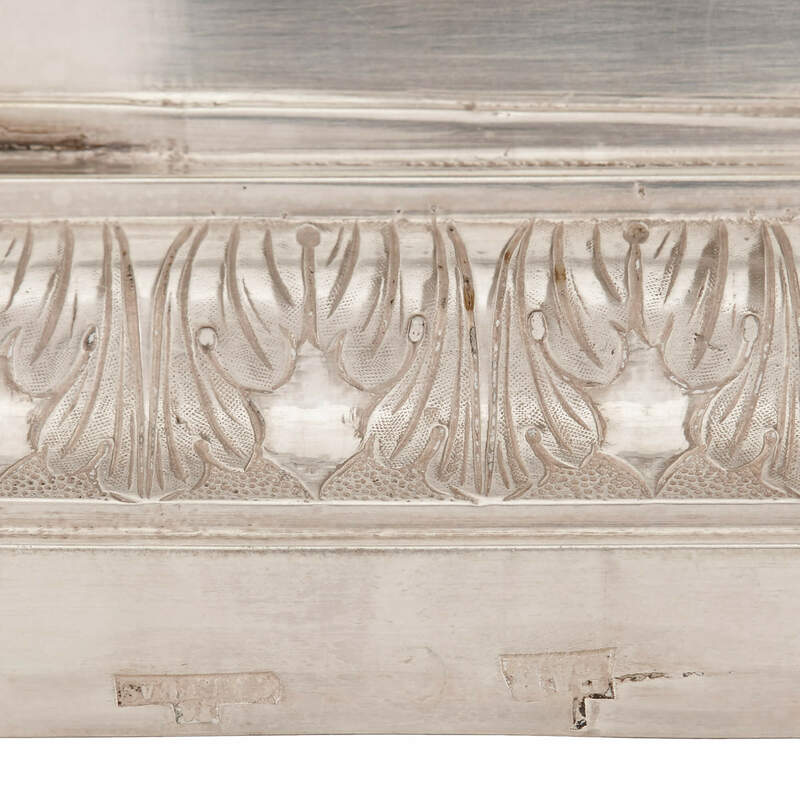 The two figures have been delicately articulated by the act of chasing, which involves carefully hammering a groove, furrow, channel or indentation into the face of the silver. 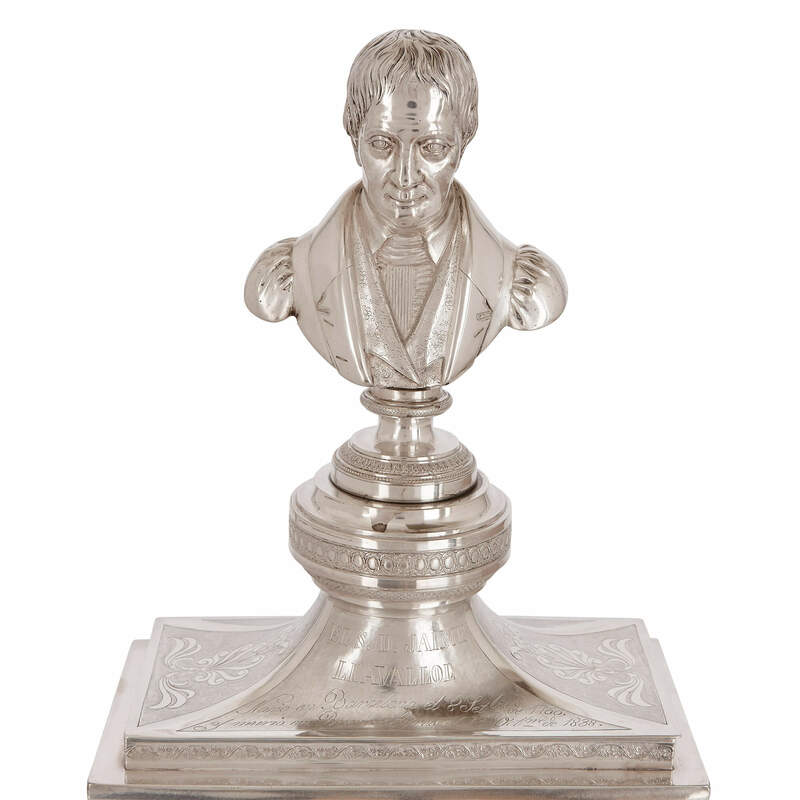 Using this method, the Spanish silversmith, Jacinto Carreras, was able to precisely delineate the individual folds of drapery on the women's dresses. The coats of arms of Barcelona and Argentina are depicted on either side of the clock face, each supported by a stylised bird, possibly a peacock. On the sides of the clock, there are decorative plaques featuring a pair of down-turned cornucopias, from which springs a spade, rake and hoe, and a pole entwined by two serpents, upon which is balanced a winged helmet.